Amid the horror of Israel’s latest war on Gaza there is hope. This is just a quick note to draw attention to a change in the level and nature of solidarity with Gaza that gives it the basis to tip over into a far more significant and powerful international campaign than it has been before. None of this is to detract from the terrible death toll in Gaza – 1,961 Palestinians have been killed so far – nor to ignore the suffering that the people of Gaza are enduring, with many thousands of homes destroyed and vital infrastructure in ruins. But this is now the third time in just over five years that Israel has launched devastating attacks on Gaza – and this time, it seems to me, the response internationally in support of the Palestinians has been far stronger than it has been before. I want to look here at factors outside Gaza that illustrate this change, but before that, it is worth noting two significant developments inside the embattled territory. The first is the stronger military response of Hamas fighters this time around to the overwhelmingly greater power of the Israeli military machine. This means the number of Israel’s (almost entirely military) casualties is far higher than before. Of course the figures are far smaller than the (mainly civilian) Palestinian death toll, but the world’s fifth strongest military force does not expect to find itself losing soldiers on this scale to the upstart forces of Hamas. Israel has had something of a shock. These are among the factors that have led some commentators to suggest that Israel might rue its recent foray – or indeed that it has lost its latest war. The second factor – and most obvious to us in Europe and around the world – is the huge volume of photographs and small bits of news now coming directly from individuals in Gaza and available everywhere via social media. This has opened the eyes of millions – and at the same time pushed the mainstream media into far more serious coverage of Gaza’s plight. Now let’s look at the situation outside Gaza. During the years of the Oslo Peace Process – possibly the least peaceful peace process in history – if you went on a pro-Palestine demo in London, like the annual Nakba protest, you might know a worryingly large proportion of your fellow marchers. They were good people, committed campaigners, but this was a sign that the issue of Palestine had not broken out of a narrow section of the left. Those days are gone. The last 10 years or so have seen wave after wave of anti-imperialist protests, especially against the US-UK war on Iraq, that have radicalised a generation of activists, and pushed Palestine up the agenda. 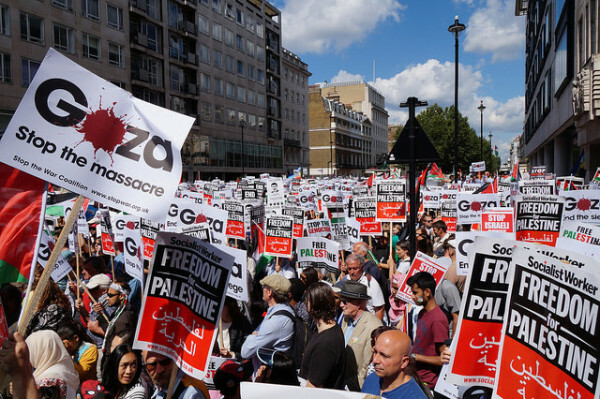 Now people are marching for Gaza and for a free Palestine on an unprecedented scale – a level of protest that leaves behind even the substantial mobilisations against Israel’s “Cast Lead” assault in 2008-9. London saw its largest ever Palestine demo last Saturday, with 150,000 on the streets. These protests have been young and upbeat, urgently and insistently demanding justice for the Palestinians – and increasingly raising more concrete demands, such as an arms embargo on Israel. 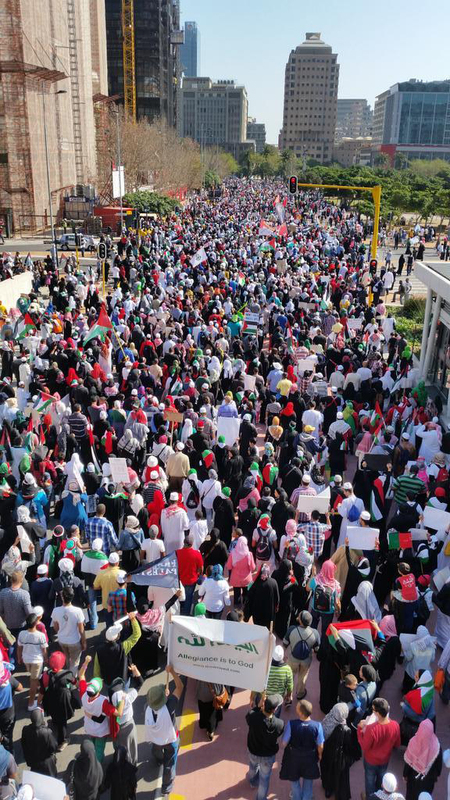 People have marched for Gaza in cities, and sometimes even small towns, in many parts of the world. The Independent newspaper estimated that more than a million people were on the streets around the world. The enormous protest in Cape Town, South Africa, was particularly notable, both for its size – estimates have ranged from 50,000 to 200,000 people – and for its significance in the state where apartheid was defeated. There have been lots of local actions, including town centre protests, boycott-related demos at supermarkets and all sorts of local initiatives to fundraise for Gaza – it was great to see a picture of kids in my area who set up a “Free, free Palestine” charity car wash, to give just one of many examples. This is a participative movement, drawing lots of people into action for the first time. Baroness Warsi’s resignation as a foreign office minister was a very significant event. It is very rare for politicians, especially serving ministers, to resign on issues of principle. It shows the deep divisions in David Cameron’s government over its shameful support of Israel. Warsi’s move – and her outspoken statement of her reasons – are a warning to a future Labour government too. Warsi’s parting call for an arms embargo on Israel was followed by the excellent initiative by protestors who occupied the factory roof of UAV Engines, a subsidiary of Israeli arms firm Elbit that makes parts for military drones – a great way to highlight how deeply embroiled Britain is in Israel’s war. Now Cameron has been forced to launch a “review” of arms exports to Israel. That is not the same as cutting off the supply of arms to Israel – worth £42m since 2010 – but it is a move under pressure in the right direction. The Commons arms export committee of MPs has demanded a probe into the additional £8bn of “dual use” exports to Israel to determine what might be being used in the attack on Gaza. Other institutions are also under pressure. The BBC’s shameful coverage has become a byword. But the official British state news agency was forced to cover Saturday’s demonstration to keep its credibility alive. It was also forced to air the Disasters Emergency Committee’s appeal for aid to Gaza – an umbrella appeal for a range of charities – something it has refused point blank to do before. The political demand for international sanctions against Israel is now starting to become a reality, with Latin American governments at the forefront. Brazil, Chile, Ecuador, El Salvador and Peru have all recalled their ambassadors from Israel, adding to Bolivia and Venezuela which had already done this in 2008-9. Chile has suspended talks on a free trade agreement with Israel. The government of the Maldives has ditched three trade agreements with Israel and is looking at banning Israeli imports. These state sanctions represent a big upscaling of the boycott, divestment and sanctions (BDS) campaign. The BDS campaign against apartheid South Africa has long been the example that pro-Palestine campaigners have drawn on. That was a huge, worldwide movement of millions that helped to pile both political and economic pressure on the apartheid regime, making it a pariah state and providing concrete solidarity with black South Africans fighting for freedom. From Cape oranges, to South African container ships, to sporting stars the message was clear: if it’s from the apartheid state, don’t touch it. The BDS movement for Palestine has not been on anything like the scale of the South Africa campaign. It has been largely a case of plugging away, with small groups of campaigners gaining occasional successes. A step forward in Britain came with the wave of student occupations in protest at Cast Lead in 2008-9, which were small-scale but attracted wider support and successfully put concrete demands for divestment to universities. A growing number of trade unions also support the BDS campaign, something that could bring the boycott into the homes of millions of workers. But Israel’s assault on Gaza has ratcheted up the BDS campaign. Instead of the slow drip drip of divestment successes, and a consumer boycott culture among a relatively narrow group of people – mainly from the left and the Muslim community – it now feels as though we have just pushed through a tipping point. There is now a visible, tangible, real base on which to build a broad campaign on the scale of the apartheid South Africa boycott. Boycott-related demos at supermarkets have popped up all over the place. These are no longer the preserve of the few who have struggled to keep Palestine in the public eye for many years – they are drawing in much wider layers of participants. The National Union of Students national executive has broken with a tradition of hostility to pro-Palestine campaigns to support a BDS resolution for the first time. In an illustration of the way a relatively small move to boycott can have a big political effect, the Tricycle Theatre’s very careful request that the UK Jewish Film Festival – which it has hosted for many years – should not take funding from the Israeli Embassy, has hit home hard, causing a furore in Israel itself and among the country’s supporters. Big companies are now rushing to dissociate themselves from Israel, fearing the boycott movement. International coffee chain Starbucks has frantically reissued a statement that it does not fund the zionist state. Cosmetics giant Garnier was forced to distance itself from a gruesome publicity stunt – which it says was the initiative of a local retailer – where Garnier products were sent in “care packages” to women Israeli soldiers. Big businesses in Israel are starting to feel the pinch. Fruit juice exporter Priniv is just one of the firms hit as importers grow shy of Israeli produce. It reported that it had lost deals in Sweden, Belgium and France as a result of the attack on Gaza. And now with the call for an arms embargo, the crucial element of the demand for sanctions has suddenly come to the fore. This is the key political demand that puts pressure on our own governments to stop supporting Israel. This is the combination of factors that have put the campaign for solidarity with Palestine on a new level. There is far more awareness, greater anger and a new readiness to mobilise for Palestine among far wider sections of the population than ever before. There is the potential to transform the international movement for Palestine into something on the scale of the worldwide anti-apartheid campaign. 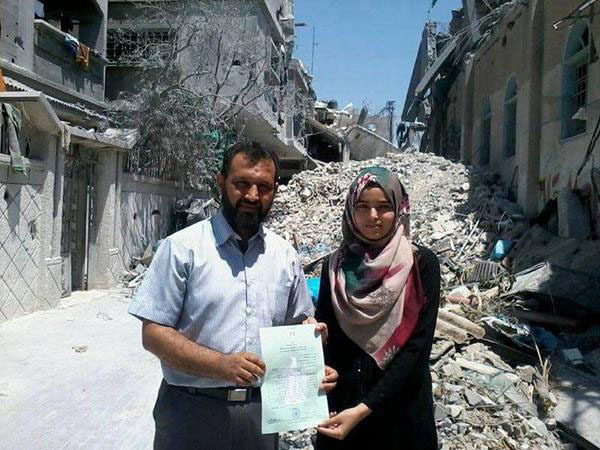 This picture of a young woman with her graduation certificate – “Graduation with distinction” – posing with her father outside the ruins of their home, is just one illustration of the courage and resistance that the people of Gaza have shown. That resistance and the need for international solidarity will continue. It is time to raise our sights. I’ve noted, in addition to your comments that there has been a visible increase in the number of Jews internationally opposing the attack on Gaza in particular, and more importantly Zionism and the Israeli state. The narrative is changing.